Jewish man succumbs to wounds after being stabbed at Gush Etzion Junction. Terrorist shot and neutralized. An Israeli man of about 40 was murdered in a stabbing attack near the shopping center at the Gush Etzion Junction. 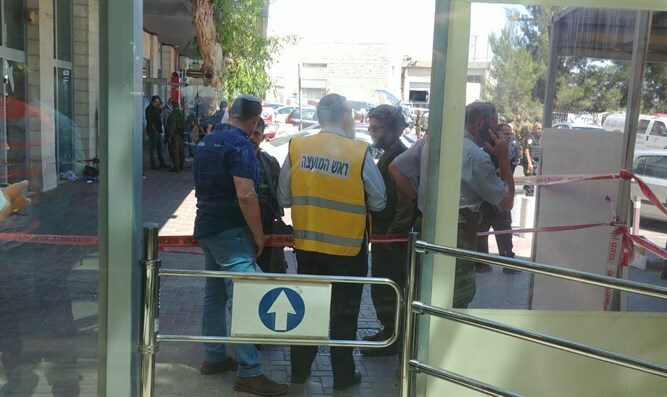 According to the IDF, "Following reports of an attack at the Gush Etzion Junction, a terrorist arrived at a mall adjacent to the junction armed with a knife and stabbed a civilian, severely injuring him. An additional civilian who was at the scene neutralized the terrorist. IDF troops are operating at the scene." MDA medics Hagla Erez related: "I was making purchases at the shopping center when I heard shouts and shots near the entrance. I immediately ran to the scene and found a 40-year-old man lying unconscious, suffering from stab wounds to his upper body." "I administered life-saving first aid which included stopping the bleeding, and reported to MDA about the incident. Together with MDA staff and an IDF medical team that quickly arrived, we continued medical treatment, and the victim was evacuated in serious and unstable condition to the hospital." “I want to say clearly that even if we are hurt, victory will be with us. The method of hurting us in the end will not pay off. We are here forever."